Function: PDF to Word, Excel - Easily Editable Documents! Convert your PDFs to Microsoft® Word documents for easy editing! 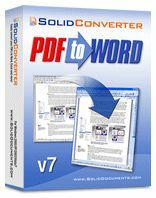 Solid Converter PDF to Word converts tables, hyperlinks, rotated text, and more, all at a fraction of the cost of Adobe® Acrobat®. Convert legacy scanned PDF files into well formatted, editable Word documents. Scan directly from paper to well formatted, editable Word documents. Select the content you wish to convert to Word directly from the PDF page. Formatting, styles, layout preserved. Convert selected text, tables or images from a PDF file. Creates formatted content in Word, tables in Excel or image files. Use advanced document reconstruction to convert PDF to formatted W3C compliant XHTML. Figures out columns. Removes headers, footers and images. Use advanced document reconstruction to extract flowing text content from PDF. Figures out columns. Removes headers and footers. No need to waste hours reformatting and reworking your converted Word files. Advanced options for converting or removing headers and footers. Superior reconstruction of bordered and borderless tables as table objects, with formatting, in Word. PDF form fields are recognized and converted into text boxes for easy editing. URL hyperlinks in the original PDF are automatically transferred into the new Word document. Extract pages from a PDF file as a single new PDF or as multiple new PDFs for each page. Save time by using batch conversion palettes in the UI or using scripts from the command line. Secure your PDF files using 128-bit RC4 or AES encryption algorithms. Automatically create PDF bookmark outlines from Word, PowerPoint, Excel or Publisher documents. Create PDF/A-1b documents which are fully compliant with ISO 19005-1 archiving standards. There’s practically no learning curve with Solid Converter® PDF. You can be up and running in minutes. Copyright 2010 @ PROGRESSIVE GATEWAY TECHNOLOGY. All Rights Reserved.